Start by choosing your favourite range, or review our entire collection to make your choice from there. Then, choose from one of our 24 colors and 5 finishes, and select your hob and oven configurations! 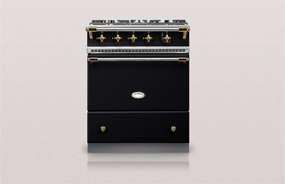 Discover your very own Lacanche by clicking on "Display My Range" and send us a quote request. We'll get back to you within 24 hours. Some top options are only available with specific configurations and are displayed accordingly. For specific enquiries, please include a note with your request. All ranges include: 2 trivets, 1 wok ring, 2 racks / 1 pastry plate / 1 roasting pan per oven. Classique Top ranges also include a simmer plate accessory. Thank you, your request has been received! We will get back to you within 24 hours. Please check your junk / spam folder if you do not receive a response within that time. Images for illustration purposes only - generated from The French Barn website. Would you like to receive more information about our matching range hoods? Where did you learn about Lacanche? Air Freight: 10-14 weeks (Add'l charges apply), Ocean Freight: 5-6 months. I am interested in Air Freight for a quicker delivery.